Kompakte und preiswerte Vulkanisierpresse mit geringem Stromverbrauch. Stahlführungen gewährleisten einen gleichmäßigen Druck auf die Formen. 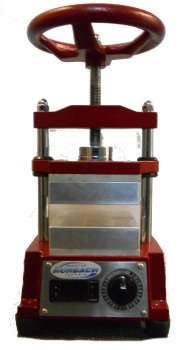 A compact and low-priced vulcanizer with small power-consum. Leaders made of steel give a guarantee for a constant press onto the mould. For vulcanizing rubber molds.This well-built, affordable vulcanizer is able to perform consistent heating for your mold making. Wir bieten Ihnen den kompletten Wartungs- und Reparaturservice rund um Geräte und Maschinen des Goldschmiedebedarfs. Please contact us in case of service or repair for any machine of the jewellery-branch.